Conny talking about the methods of measuring light in camera vs with a light meter. This semester we’ve limited the number of students a bit from last semester (the darkroom got way too crowded when all of them wanted to print at the same time so a reduction was necessary) and it felt like a good size group. This way everyone can have enough access to the machines once we start fiddling around with the enlargers in a few weeks’ time. This weekend was all about acquiring the actual images onto film. We provide the students with the materials (film, chemicals, paper) and all they have to bring is a camera. Three of them had 135 cameras (all Nikons I think) and one had a Hasselblad 120 camera. Thank goodness my fellow club member Conny was there to help me teach the first class (he’s better at explaining the exposure process) since he’s had ample experience with loading and shooting with Hasselblad cameras! Glorious spring sun and warmth in honor of our students! 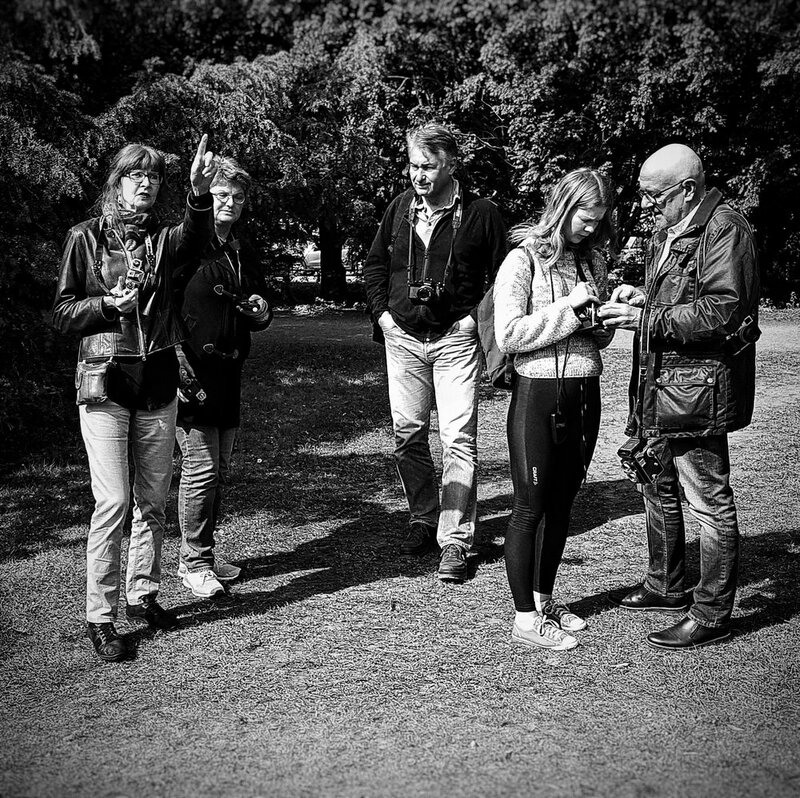 After our little walkthrough of how sensitivity (ISO), aperture and exposure times are all part of how we control the amount of light getting into the camera and onto the film we loaded up the various cameras and headed out into the nearby park. I’d gotten them Tri-X 400 and Fomapan 400 film and with all the blazing sunshine it was almost too much sunshine (only photographers could moan about that…right? ), but I am sure we’ll get workable negatives from it…at least enough to make a print or two from later down the line.